The internet is transforming every aspect of our lives. It has become indispensable. But, so far, according to a new meta-analysis we have published in the Journal of Economic Surveys, the internet has done next to nothing for economic growth. Vast resources have been thrown at information and communication technologies. Yet despite exponential growth in ICT and its integration into almost all aspects of our lives, economic growth is not demonstrably faster (and at the moment is demonstrably slower) than it was beforehand. This productivity paradox has caused angst and raised questions about whether the trillions invested in ICT could have been better invested elsewhere. We reassessed ICT through a meta-analysis of 59 econometric studies incorporating 466 different observations in both developed and developing countries. We divided ICT into three categories: computing, mobile and landline telephone connections, and the internet. For developed countries, we found that computing had had a moderate impact on growth. Mobile and landline telephone technologies also had a small effect. But the internet has had no effect, at least not as far as can be ascertained from the research to date. Ever since the Industrial Revolution, innovation and technological change have driven rising productivity and economic growth. Information and communications technologies ought to follow in those footsteps. Instead, productivity growth in US manufacturing has slid from 2% per year between 1992 to 2004 to minus 0.3% per year between 2005 and 2016. Where ICT innovations do lead to an increase in productivity, it’s often a one-off boost rather than an ongoing increase year after year. More disquieting, there is some evidence suggesting that rather than contributing to economic performance, some parts of ICT can harm it. The internet can be an enabler of procrastination. Cyberslacking can take up to three hours of work a day. It isn’t all bad. Many of us get a lot of joy from catching up on social media and watching dog and cat videos. But if everyone is distracted by it, little gets done. The internet has also enabled greater flexibility in work, another plus. But if it contributes little to economic growth, it is worth asking whether our economic managers should continue to fund its expansion. For developing countries, generating economic growth is pressing because resources are scarce. ICT has been held out as a saviour. Yet, it has almost always been found that more obvious innovations, such as running water, electricity, and primary education for girls, have bigger payoffs. Our own findings show that developing countries benefit from landline and mobile phone technologies but not at all from computing, at least not yet. ICT might need to reach a critical size before its effects matter. 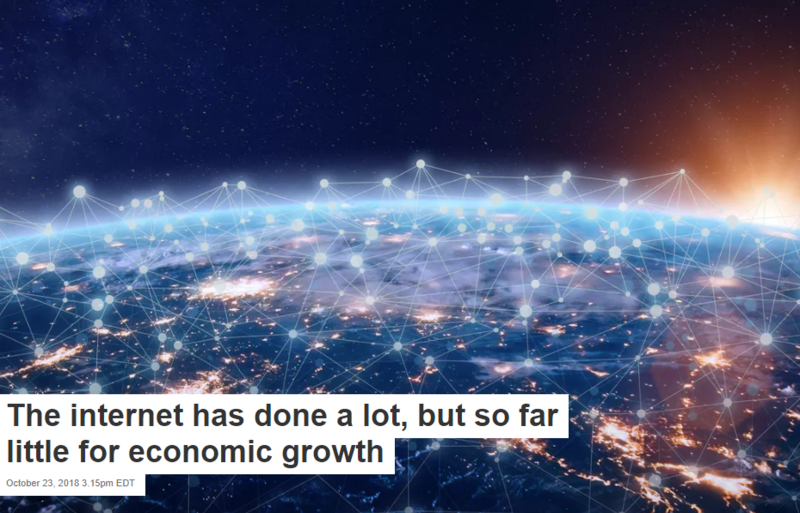 The time it takes for ICT investment to generate economic growth might be longer than expected, and it might need to reach an even bigger critical mass before that happens. But it’s hard to avoid the conclusion that, for the immediate future, growth will continue to depend upon more traditional sources: trade between nations, education, new ideas, the rule of law, sound political institutions, and curtailing inequality. Unfortunately, these are under threat from growing nationalism and protectionism in the United States and elsewhere. The evidence to date suggests that we would be better off fighting those threats than investing still more in an information technology revolution that has yet to deliver.